Almost 300 Maryvale students from around the world were honoured for their accomplishments at the Institute’s 2018 Further and Higher Education Awards Ceremony, held at the iconic St Chad’s Cathedral last month. There were plenty of smiles and proud faces from the graduates during the academic procession into the grand building, where family and friends had gathered to support their loved ones. The ceremony was formally opened by the Most Reverend Bernard Longley, President of Maryvale Institute and Archbishop of Birmingham, and was followed by an introduction from Fr Edward Clare, Director of Maryvale Institute. Congratulating the successful students, Fr Edward Clare commended “the commitment, dedication and the sheer hard work” that they had devoted to their courses, also acknowledging the contribution and support of their families and friends, many of whom were present at St Chad’s. Fr Edward also paid a heartfelt tribute to the previous Maryvale Director and, in recent years, teacher to many of the students present, Mgr Paul Watson who sadly died a month ago. While emphasising the sadness felt on Fr Paul’s passing, he tempered this with the: “Huge appreciation of the contribution that Fr Paul made to Maryvale over those 12 years. Before presenting the graduands with their awards, special guest, Right Reverend Philip Egan, Bishop of Portsmouth, addressed those present. 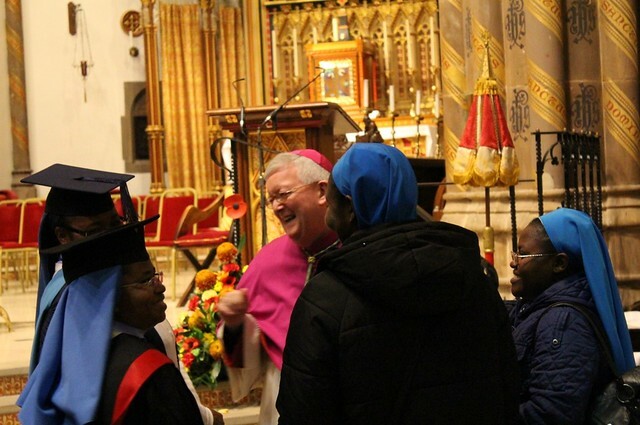 While emphasising the challenges faced by the Church’s evangelisation mission in the 21st Century, Bishop Egan praised Maryvale’s 'critical' purpose both in the UK and internationally as “a place of formation, especially…for the laity”. He echoed Blessed John Henry Newman’s call for “a laity who know their religion…who know just where they stand…who know their creed so well, that they can give an account of it. I want an intelligent, well instructed laity;” an aspiration that remains as relevant today as when it was first delivered in 1851. “Your studies and the awards you have gained equip you not only to aspire to a deeper understanding of the Faith but also for service in the Church. "See your degree as a deepening for the sake of a reaching out. My hope and prayer for you today is that you don’t see your theology as somehow cutting you off from others but equipping you to engage with others, particularly with those of other disciplines, other cultural sectors and other points of view. "There is a huge need to bring theology today into a critical conversation with science, psychology, medicine, economics, environmental studies, sport, the arts, media, politics, nursing and so on. "Theology can often contribute to these disciples the basic anthropological component, that is, a holistic view of the human person, an account of what is real, good, beautiful and loving, and a resolution of philosophical and ethical conflicts that could undermine an endeavour. On concluding his speech, Bishop Egan presented diplomas to around 50 students who had graduated from a wide range of the Institute’s Further and Higher Education programmes, from Certificates in Catechesis, Healthcare Chaplaincy, Marriage and Family, Parish Mission and Ministry, and Religious Studies to Divinity and Philosophy degrees, postgraduate MAs in Catholic Applied Theology, Ecclesiastical Licences in Catechetics, and PhDs in Catholic Studies. This year three research students successfully defended their theses, leading to their PhD degrees from Liverpool Hope University through its partnership with Maryvale. All Maryvale’s courses are taught through part-time distance learning, making them particularly accessible and attractive to people who need to combine their study with working, family or other commitments – as well as those from overseas. Following the presentation of awards, four students had been nominated and received a special prize for their accomplishments in Catechesis, Research and for the Special Achievements. Additionally, for the first time thanks to the generosity of alumni, an award in the name of Canon John Redford for Academic Excellence in Theology was announced. Due to the international character of the Institute, not everyone could attend the ceremony at St Chad’s. While the achievements of Maryvale students at centres in Abu Dhabi, Edinburgh, Portsmouth and Singapore were acknowledged and commended on the day, domestic graduation ceremonies have already taken place in those dioceses. Representatives from several of Maryvale’s validating bodies – The Open University and École Cathédrale in Paris – were also in attendance and took part in the ceremony. Sincere thanks were also given to Maryvale staff and the Bridgettine sisters for all their hard work and commitment, which contributes towards the unique atmosphere of 'The Maryvale family'. To conclude, the congregation took part in Evening Prayer at the Church before moving onto refreshments back at Maryvale.